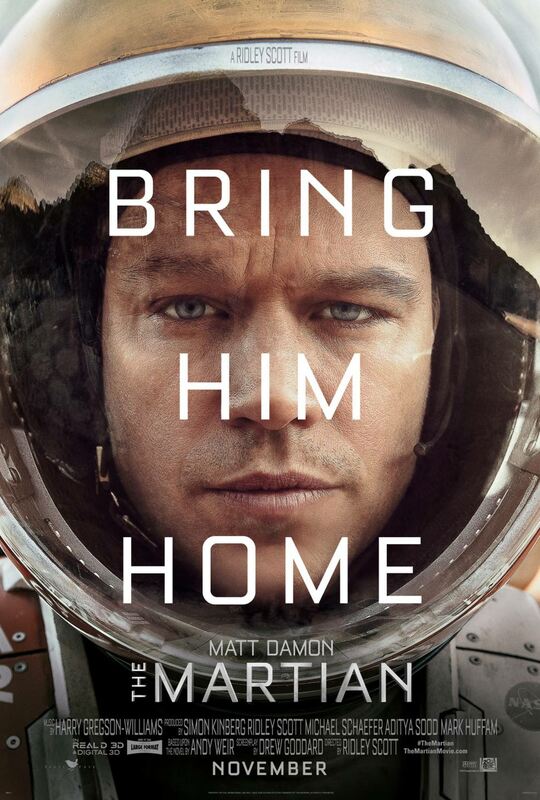 Sci-fi epic from Ridley Scott, starring Matt Damon, Jeff Daniels, Kristen Wiig and Jessica Chastain. He’s also one of my favourite directors, while I’ll happily watch Matt Damon in anything and have seen everything he’s ever done. I’m also a massive sci-fi fan. To say I had high hopes for The Martian is an understatement. All the ingredients were there: a strong story from an original novel, a great cast and director, the full backing of a major studio. What could possibly go wrong ? So far, so Robinson Crusoe, right ? Well, if anyone should get stranded on a desert island, sorry, planet, it’s a botanist. At least he can grow stuff .. can’t he ? And that’s about as far as I’m willing to go with the story because anything more will just spoil your enjoyment of the film. Suffice to say it’s a grim scenario and he was more accurate than he could possibly know when he described it to his video log. The movie switches between Watney recording his thoughts and theories for posterity, scenes of him actually doing “science” and what’s happening back on earth and on the returning ship with the rest of the crew. It’s well-paced, allowing the story to unfold naturally while at the same time giving the audience chance to absorb the jargon and physics involved, and gradually builds momentum over a surprising 141 minutes (it felt like much less) to a gripping denouement. Visually, the movie is flawless. And yet .. something was missing. I may be nitpicking, but this was a relentlessly upbeat saga. There’s some genuine laugh-out-loud moments from Watney when he’s alone – in particular, one which cleverly uses the planet’s atmosphere to make the gag work – and yet there’s not much in the way of gallows humour .. of Tom Hanks losing the plot and christening a football, say. In fact, I’d go so far to say as there’s little in the way of any kind of psychological study of Watney or the crew members as they discover the fate of their friend and colleague. Maybe it’s just a British thing, but nobody could be that cheerful about a situation like that, could they ? Stiff upper lip, chaps .. we’d be determined but we’d also be weeping into our potato tea every now and again, wouldn’t we ? Another thing I found slightly odd was the casting of both Daniels and Wiig as senior NASA staff members. I kept expecting the former to make a fart gag and the latter to snort with laughter as he did so .. I’m not sure if that says more about me or their abilities as actors to own a comedy role, to be honest. 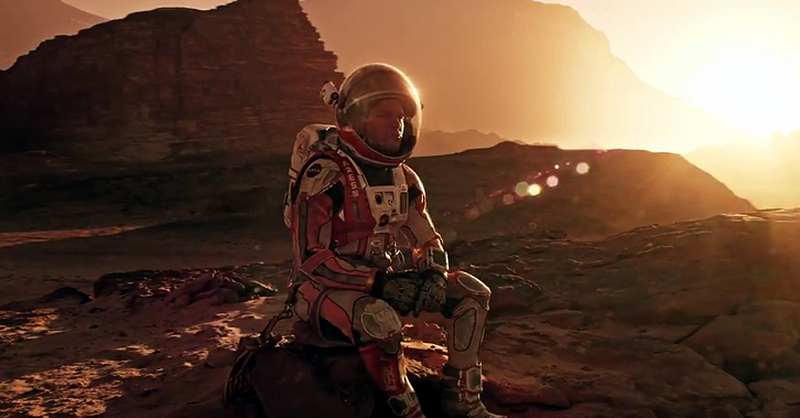 The Martian is a work of art, despite my hypercritical observations above. Matt Damon is the everyman all-American hero that you can’t help rooting for and follows in a long, distinguished line of great screen actors from James Stewart and Henry Fonda, through Ed Harris and Hanks himself, right up to Damon, Ed Norton and Sam Rockwell in the modern era. I would be amazed if he isn’t nominated for an oscar for this performance – you’ll see why when you watch it – and had it not been for Tom Hardy’s dual lead in Legend I would even expect him to win it. That, and the fact he already has one of course .. This is an epic picture and deserves to be seen on the big screen, 3D glasses or no. It’s up to you, but see it at the cinema. Soon. This entry was posted in blogging, English language, Film Review, Media, Movies, observation, Opinion piece, Review and tagged film review, jeff daniels, mars, mars mission, martian, matt damon, mission to mars, movie review, nasa, review, ridley scott, sci-fi, science fiction, scifi, space, space film, space movie, the martian, the martian film, the martin movie by rigger67. Bookmark the permalink.